Outdoor activities take place in an environment where risk can be managed through good practice, experience, fitness and skills. However, no outdoor activity can ever be 100% safe. The safety of the group (including my own) is paramount in whatever activity is being undertaken. If completed participation forms are asked for, please complete these with any information that might impact your participation. The above excerpt from his DLOG confirms that Al holds the Hill and Moorland Leader Award of Mountain Training UK and the Expedition Module. As a member of the Mountain Training Association, Al must follow a plan Continuing Professional Development. Mountain Training UK also requires that he keeps up-to-date on best practice. Al is working towards his Mountain Leader (Summer) Award, so has additional training and experience. Alter a route or curtail an activity for the safety of the group. Exclude someone who does not comply with safety instructions, is inadequately equipped or is impaired by drugs to an extent that they are judged to be a risk to themselves or the group. Require, without exception, that anyone under 16 is accompanied by a responsible adult over 18. Hills of Hame is insured by Ascent through the Mountain Training Association members’ group policy, which is in turn underwritten by Hiscox. 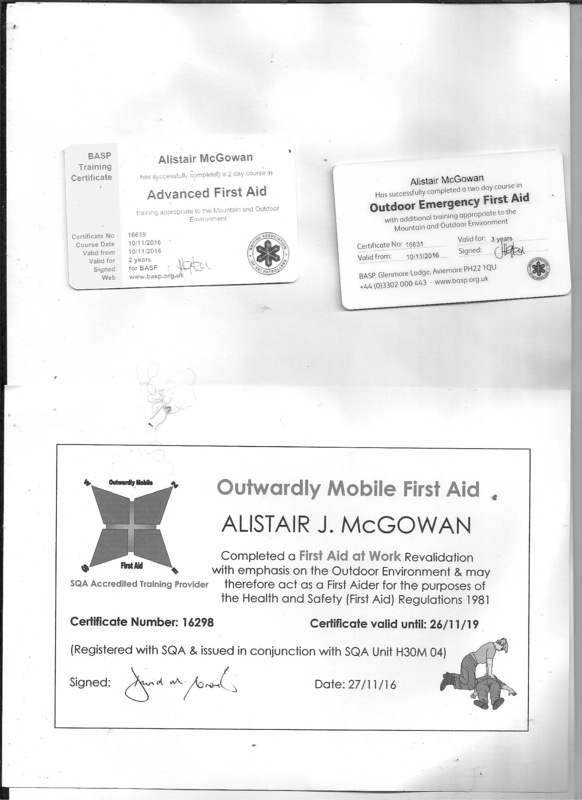 Al holds a number of first-aid qualifications (see below) and also works as a first-aider at outdoor events for Rescue Medics. Al carries appropriate kit to provide first-aid to clients. Please remember that if you need any medications, this should be declared on your participation form and you MUST carry your own supplies of medication and a medi-alert tag or screensaver on your phone.